Description: Amaco Rub-N-Buff is a wax based metallic finish that is formulated from imported carnauba waxes, fine metallic powders and select pigments. This unique blend gives pieces decorated with Rub 'n Buff a finish that no paint can duplicate. It can be applied to any clean, dry surface as well as over previously painted surfaces. Use for crafts, home decor, frame finishing, stenciling, faux finishing and restoration. One tube covers up to 20 square feet. 1/2 oz. Spanish Copper. See more Amaco Rub-N-Buff Metallic Finishes. 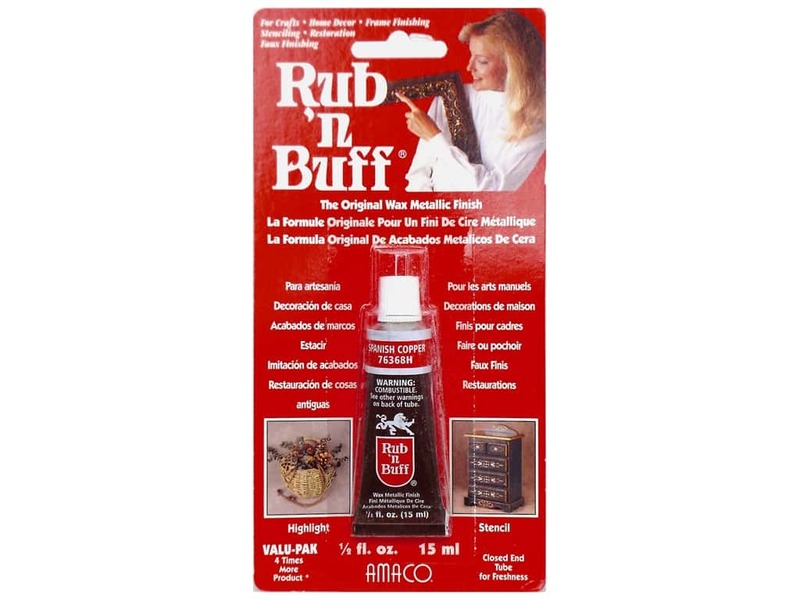 Amaco Rub-N-Buff 1/2 oz. Spanish Copper -- CreateForLess 2.00 out of 5 based on 1 ratings. 1 user reviews. I had seen a bunch of videos on Youtube of people using this product to great effect. I bought 3 different colors, each was a completely different consistency and it was nearly impossible to get any of them to go on evenly. Don't waste your money, just use spray paint.